Dr. Ninoutchka Dejean, who is fluent in both French and Spanish, is board certified by the American Board of Obstetrics & Gynecology and graduated from medical school at the University of Florida College of Medicine in Gainesville. 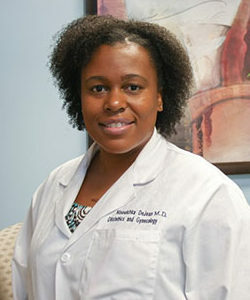 A vConfidence approved physician, Dr. Dejean completed her residency training in Ob/Gyn at New York Medical College, under the guidance of Dr. Karmin and practiced in New York before joining Boca Women's Health with Dr. Karmin, extending Boca Women’s Health’s decade long reputation for offering personalized care to women of all ages and backgrounds in a private and relaxed atmosphere. Personable and knowledgeable, Dr. Dejean is a member of the American Congress of Obstetricians and Gynecologists and is known for being especially warm, open, caring, and extremely patient, with a great bedside manner, and very knowledgeable and professional while encouraging her patients to ask questions. At Boca Women’s Health, with their incredibly caring and professional staff, you will feel at ease in the friendly offices which are designed with warmth and sensitivity to make your visit a comfortable and pleasant experience. By providing state of the art, comprehensive healthcare for women in every stage of life, Boca Women’s Health respects your time and will make every effort to get everything done for you at the time of your visit, including blood work done in our office – saving you a separate trip to the lab. In addition, our physicians perform all of their own ultrasounds, saving you from a second appointment elsewhere, and allowing you to receive your results quickly and conveniently. Dr. Dejean’s focus is on the management of gynecologic disorders and performing minimally invasive office-based procedures such as hysteroscopy, endometrial ablations, and Essure permanent birth control. She offers evening appointment hours as well as Saturdays for the convenience of her patients. As a vConfidence approved physician, Dr. Dejean is pleased to offer advanced vaginal laser rejuvenation procedure for vaginal dryness, stress incontinence, and vaginal relaxation during a painless 5-minute office procedure that is an exciting new hormone free option to improve vaginal health. For a private and relaxed atmosphere designed to make you feel more comfortable and to make your visit stress-free, please contact us today to schedule your consultation with Dr. Dejean and find out what a difference the vConfidence advantage can make in your feminine life.